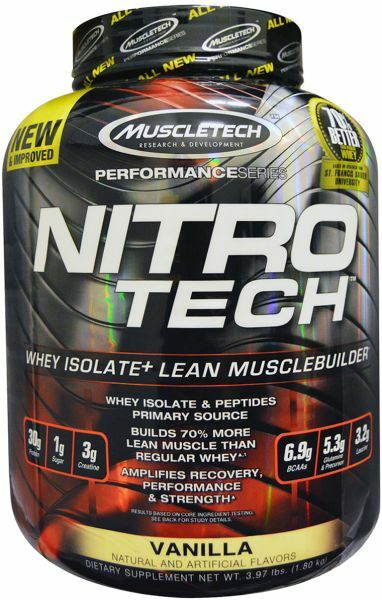 Nitro-Tech is a scientifically engineered, enhanced whey protein formula designed for all athletes who are looking for more muscle, more strength and better performance. Nitro-Tech contains protein sourced primarily from whey protein isolate and whey peptides two of the cleanest and purest protein sources available. Other whey protein supplements might have only a few grams of these highly bioavailable and easily digested proteins. Nitro-Tech is also enhanced with the most studied form of creatine for even better gains in muscle and strength. Ingredients: Isolate protein and peptide blend (whey protein isolate, whey peptides, whey protein isolate 97%), whey protein concentrate, maltodextrin, calcium carbonate, natural and artificial flavors, gum blend (cellulose, xanthan, carrageenan), enzyplex (papain, amylase), salt, sucralose, acesulfame-potassium, soy or sunflower lecithin. Contains milk and soy ingredients. Processed in a facility that also processes egg, wheat, tree nut, fish, shellfish and peanut ingredients. Direction of Use: Mix 1 serving (1 scoop) in 6 oz. or 2 servings (2 scoops) in 12 oz. of cold water or skim milk in a glass or shaker cup. Use between major meals and after exercise. Drink 8 to 10 glasses of water daily. For maximum results, consume 4 scoops of NITRO-TECH daily for a minimum of six weeks. Warning: This product contains 3 g of creatine per serving which is in addition to the 30 g of protein per serving shown in the Supplement Facts. Creatine, in combination with whey protein, has been clinically shown in a published study in the International Journal of Sport Nutrition and Exercise Metabolism to be more effective for building muscle than just whey protein alone. There are no added amino acids contained within this formula that are counted towards the total amount of protein listed on the label.